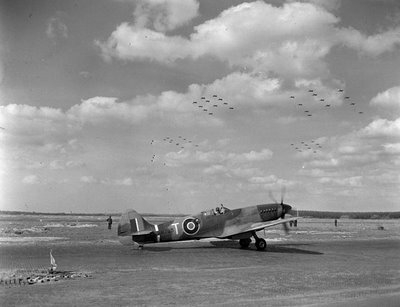 This photograph shows a victory salute by Spitfires of No. 84 Group, 2nd Tactical Air Force over an airfield somewhere in Germany to celebrate the end of hostilities in Europe. Taxiing in the front is Spitfire FR Mk. XIV, serial number RM795 of No. 414 Squadron RCAF. This unit received their Spitfires Mk. XIV only in April 1945, trading in their trusty Spitfires Mk. IX. Despite being a reconnaissance unit, the Canadians had rather frequent engagements with German fighters, the last one taking place on 2 May 1945, during which the Spitfire pilots claimed several victories, including four(!) credited to F/Lt “Sammy” Hall. Not the circular camera window behind the cockpit which was a distinctive feature of the FR variant of the Spitfire Mk. XIV. No. 414 Squadron was assigned the code letters RU, but after 1943 their aircraft used to carry individual aircraft letters only.